The temptation was struck my family. At first my brother, who contracted the rare disease, Steven Johnson, and now my mother who contracted pneumonia. 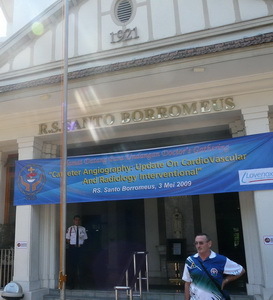 But both have in common, namely through a period of treatment at a hospital in Bandung city’s oldest, ST. Borromeus. The hospital is located on Jl. Ir. H. Juanda (better known as Jl. Dago). Is a private hospital that could be considered quite modern, complete and advanced in terms of health. Yet if we look at history first, this hospital began as a simple clinic. Pioneered by six nuns in 1921: Sr. Crispine CB., Sr. Judith CB., Sr. Gaudentia CB., Sr. Ludopha CB., Sr. Ambrosine CB., And Sr. Lioba CB. Long journey to fruition, where RS Borromeo obtain ISO 9001. Until now Borromeus Hospital continues to grow in community service in the field of health. Go ahead Borromeus Hospital, and thank you for your services for all the years. This entry was posted on Sunday, September 26th, 2010 at 3:54 pm	and tagged with Bandung, Borromeus, Dago, Jl. Ir. H. Juanda, Rumah sakit and posted in History. You can follow any responses to this entry through the RSS 2.0 feed.